This adorable couture dress has a gathered pink gingham outer skirt and a green gingham tulle underskirt. We've adorned the waistline with little green gingham leaves, pink satin bows and embroidered a colourful butterfly on the body. It has a sturdy reinforced D-Ring and a double sized / double strength velcro for comfortable and secure fastening. 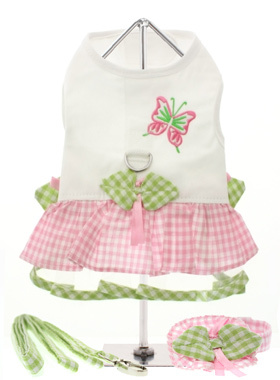 This harness dress set comes complete with a matching lead and hat (that can also be used as a fashion collar).